I am a Messenger of Peace! Doing a good deed is something all Cubs learn about as part of the Cubbing programme both locally and internationally. 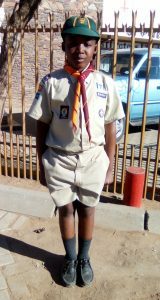 As members of the Scouting Movement we all strive to be Messengers of Peace, which is exactly what Kabelo Maretele (10) and his fellow Cubs from 5th Peter’s Cub Pack in the Free State have embraced. It’s fun because of the games we play and also because we go on hikes. My best experiences were the day hike and the overnight camp at Erlichpark! My toughest challenge at Cubs is hiking and also doing art. The most amazing place I visited with the Cubs was the Erlichpark Fire Station! 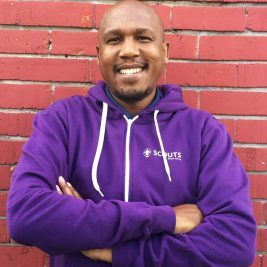 By being a Cub I learnt a lot about first aid, I learnt how to draw and also how to sing. I helped people in my community by giving food and blankets to people on Mandela day. Now I am a Messenger of Peace! I taught my mum how to light a fire and how to cook outdoors. A good Akela must be friendly! Akela is special because she loves us all! Cubbing Rocks because … we hike and play games.